Ball Lightning (2018) is a story about, well, ball lightning. It’s also about obsession, the travails of science research, the moral perils of military research, and quantum mechanics. And ghosts — in fact, quantum mechanical ghosts. I’m not sure that’s something for everyone, but it’s a lot. The potential military applications of his work bring him into contact with Major Lin Yun, a woman with some powerful obsessions of her own — though hers are mostly about finding ingenious ways to kill people, because of how her mother died. The third main character of the book is physicist Ding Li, a rather Sherlockian physicist who is also obsessed — in his case, with the mysteries of physics in general and quantum mechanics in particular. The three of them, spurred by a Sino-American war in which the Americans are deploying weird-physics weapons of their own, are soon on the trail of a ball-lightning-based weapon that might win the war. When obsessed people get together on a project, they’re often really good at making things happen, and it’s not so very long before our trio get what they want — an amazing, bizarre (and totally imaginary) explanation for ball lightning, an amazing, bizarre superweapon, and amazing, bizarre new physics, respectively. Unfortunately, obsessed people are also very bad at judging the consequences of achieving their goals, and the consequences turn out to be serious indeed — for themselves, China, and human civilization at large. Ball Lightning is a pretty strange book in some ways — in particular, to me, in that it mixes hard science with comic book physics in odd proportions. It’s not often that you’ll see an author invoke a highly anthropocentric take on the Copenhagen interpretation of quantum mechanical waveform collapse for a plot point. Published in August 2018. 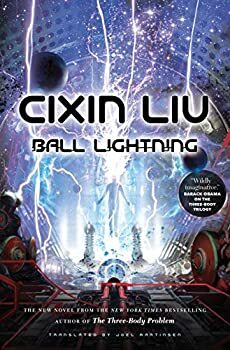 From the New York Times bestselling author of the Three-Body Trilogy, Cixin Liu’s Ball Lightning is the story of what happens when the beauty of scientific inquiry runs up against the drive to harness new discoveries with no consideration of their possible consequences. When Chen’s parents are incinerated before his eyes by a blast of ball lightning, he devotes his life to cracking the secret of this mysterious natural phenomenon. His search takes him to stormy mountaintops, an experimental military weapons lab, and an old Soviet science station. The more he learns, the more he comes to realize that ball lightning is just the tip of an entirely new frontier. While Chen’s quest for answers gives purpose to his lonely life, it also pits him against soldiers and scientists with motives of their own: a beautiful army major with an obsession with dangerous weaponry, and a physicist who has no place for ethical considerations in his single-minded pursuit of knowledge.